Wow! Was the 2015 winter for the records or what? Northern Virginia got hammered with cold and snow this February. Everyone is ready for spring to break out. The frogs and fish are starting to stir and dormant plants are showing signs of new growth. The long winter however, has taken a heavy toll on most water gardens. Organic debris from tree leaves, as well as soil and mulch run-off, can be a problem for most aquatic ecosystems like a backyard pond or water garden. This debris, if left in place, will be food for algae and make for poor water conditions throughout the season. The Pond Doctor recommends that all ponds and water gardens receive a full cleaning at least once per year to maintain their beautiful appearance and aquatic health. Failure to perform an annual clean out could result in increased maintenance or fish health issues. 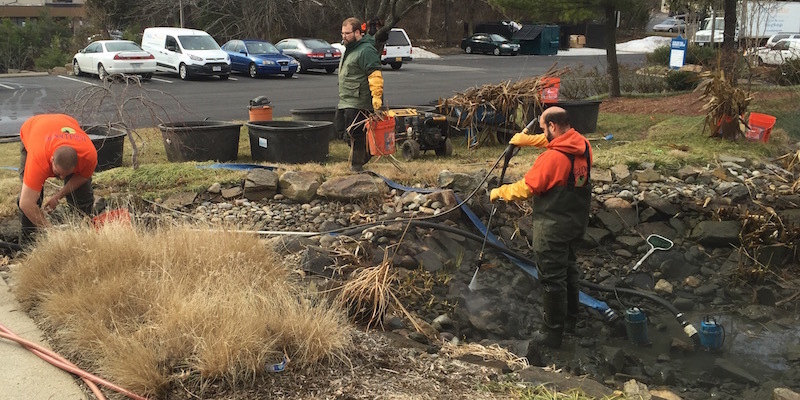 If you are in the Northern Virginia area and want us to clean your pond, this is what we do. 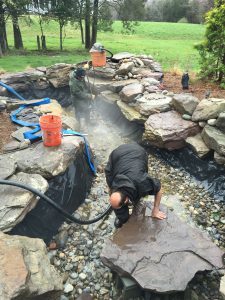 The Pond Doctor will get down & dirty with your water feature! We will drain the water (temporarily housing the fish if you have them). Next, we will give your pond or water garden a quick pressure washing and rinse (we don’t want to remove every bit of the beneficial Bio-Film). and, finally, install the waterfall pump. When these maintenance tasks are completed, we will begin refilling the water feature (and re-introducing your fish if you have them). Any requested water treatment products will be left for you. If your water garden includes a pond with fish, upon finishing your clean out we will refill the pond with enough water to re-introduce your fish. All customers receive a custom price quote for their clean out. If we have serviced your pond in the past or if we installed your pond we can give you a cost for your cleaning once you have contacted us. If you are a new customer we can usually provide a quote from an emailed picture of the water feature. Please be aware that we have several hundred customers that rely on us to help with their “Spring Start ups” every year. All Spring Maintenance scheduling is done on a first come first serve basis.